The call of the day was for Burnout T-shirts. 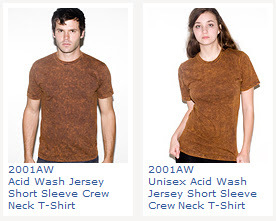 The picture on the left, found on Alternative Apparel's website, wins the prize for the best photo showing the characteristics of the Burned Out effect when worn. My pointer didn't show up in the screenshot, but you can assume what I was pointing at. Although Burnout t-shirts are available from a couple of brands, American Apparel, Alternative Apparel, Pima and probably Apparel Agents, I didn't have a style number in my head so I told the customer to search the Am App website. He called back saying that he's searched high and low, but can't find it. Once I have some time I'll do a search and see if it is really that difficult to find those. Basically they are a 50/50 shirt with cotton burned out by either chemical or a heat process, thereby making a super thin and often distressed looking shirt. All the rage, if you want a see-through t-shirt that will be difficult to print since it won't withstand much more heat. I have to assume that this style will also deteriorate quickly since it is also very thin. Lastly, Pima Apparel is very proud of a stitched Burnout effect t-shirt, but I haven't put it to a test yet. 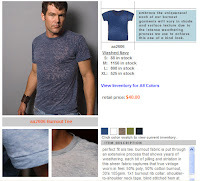 "The softest, smoothest, best-looking T-shirt available anywhere in Acid Wash Jersey Cotton." Early this morning I spent the better half updating my state-by-state index to shown some new contact info. 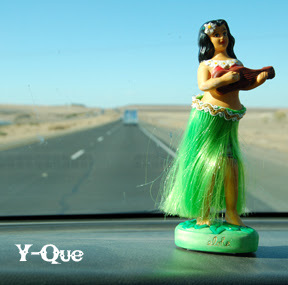 The goal here is to useful links to common resources for each state, shipping information and relevant tax data for each state that we ship to, as well as, designs that are cool enough to wear without feeling like you just left a tourist trap with a transfer t-shirt. The approach to a global catalog is something I've been working on for quite a while. If only I could apply the technology to give all of my customers the ability to create a sub site from my listings then I could finally grow my business model beyond the short-horizons type of business that I currently have. The potential is there, but I'm stuck doing hack-work most of the time. Every now and then I get a good customer like "A Fine Frenzy", which I misprinted a few hundred shirts for and I'm looking for a way to sell them, cheap, without offending my customer? I'll post a photo soon. Any who, the point is, I've made several good attempts at creating a broad platform that does what some of these sites mentioned above do, but the technology keeps pulling me back down to what I can accomplish with a few key-strokes and it is going to take more than that to allow everyone access to the vast array of services that I can provide. Luckily I'm getting bored with simply printing shirts for companies, so maybe this time something different will happen. If you haven't noticed this website will be about T-shirts. Over the years I've tried to do many things, but as a business T-shirts just keep pulling me back in. In some ways I consider my business my art, although it doesn't always seem as fun as having a career as an "artist" should be. Nonetheless, this is it, "T-shirts.org", a place to dump and pump my knowledge, resources and skill on the topic that I know best, Cotton and Ink. As you can tell from this photo, t-shirts are ubiquitous, even cotton, huge rectangular blogs of cotton, has a large white (most likely not cotton) cover draped over it. 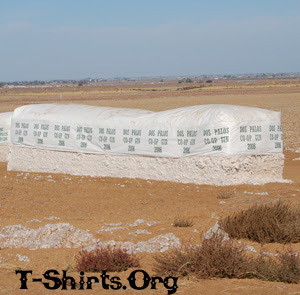 Click on the image for more detail about this particular cotton. I'm surprised this cotton doesn't have a MySpace page. Today I drove from Southern to Northern California on Highway 5 and this is the time of year when the White Bud is stacked in squares for as far as the eye can see. California Cotton is irrigated and it can be scheduled for picking almost to the minute, at least that's what I hear. I once considered buying a farm, or just renting the land, to try my hand at growing cotton, however, things didn't work out and so the closest I get to the real thing is to watch is grow when I drive up and down the state. I often wonder where does this fur end up, specifically, like what countries get this cotton? There are gins to clean the cotton and it often sits covered in the fields where it is grown for weeks, like white cubes, fuzzy obelisk waiting to be loaded onto a truck an taken to a new home. I've driven down some roads that had cotton balls the size of tumble weeds blowing around during harvest time hugging the ground like a thick fog. Apparently California Cotton is a high quality cotton and it is milled overseas and it may come back in the form of sheets, but I don't know if it is possible to find out if specific cotton is coming back in the form of thread that could be used as t-shirts. If this is possible I would definitely move on the idea of getting that thread for a line of California Cotton t-shirts. For now I have to be satisfied with what is currently available, warehoused around the US, in every color, pattern and thickness you can imagine. This site has been developed as a catalog site to offer the most popular brands that are available in order to make a living pushing cotton, but I have also considered using the ".org" concept to make this more of an organization type website and directory for t-shirts, or an Organic t-shirt focus and possibly a "Fair-Trade" t-shirt type environment. I've been working on the shopping cart and attempting to catalog some products using Open Source, which is compatible with Google Checkout, Paypal, but it has taken longer than I thought to get it operational. Reality is I've got to make a buck or two to pay my way in the world and selling t-shirts seems to be my opportunity, as it has been since I was in a punk band in the early 80's and learned to pull a squeegee. Same as it ever was. I've been through almost every facet of the business, except the farm, which I'm looking forward to when I retire, however for now I think it will help to put some of the facets of this business in front of a fresh audience who may also be drawn to the Great American Enterprise of T-shirts.